Basmati rice cooked with minced mutton,lentils and spices to a fine perfection. 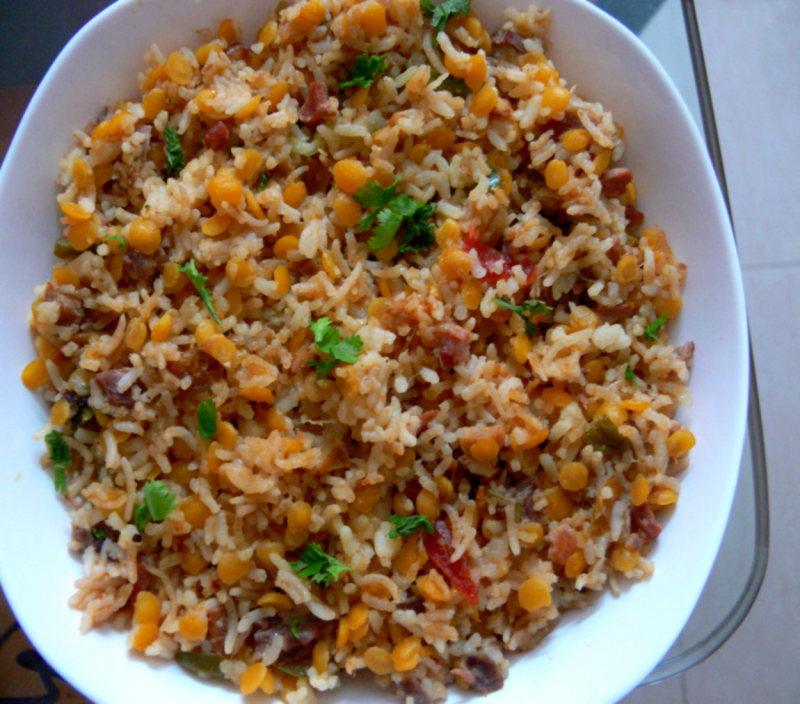 A tasty biryani to try at home. Heat oil in a pressure pan,add bay leaves,ground spices,chopped onions,chopped tomatoes and ginger-garlic paste for 4- 5 mins. Add keema, mysore dhal, chilli powder,turmeric powder,coriander powder, sambar powder, biryani powder,yellow colour-optional and 1/2 tsp salt.Mix well and saute for 5 mins. Add 2 1/2 cups second coconut milk and cover and pressure-cook for 10 mins or upto 4 whistles.Turn off the flame and open the lid after the pressure is released. Add ghee-sauted basmati rice, few drops kewra essence, green chillies,few coriander leaves,1 tbsp ghee,1 cup thick coconut milk and 1/2 cup second coconut milk.Cover and pressure cook upto 1 whistle and wait for the pressure to be released. Mix well and serve this hot garnished with boiled egg-slices,freied onions and chopped coriander leaves. Is it Mysore daal or Masoor daal? U can try this Dal Biryani with Mutton or Chicken too.I've tried this recipe with chicken (instead of keema) and it turned out well. U can try some Veg. Combination Dal Biryanis too ex. Mushroom Dal Biryani, Cauliflower or Palak dal Biryani.